Food writer May Tien shares one of her most cherished recipes from her very own repertoire of Asian-American influenced cookery. I can’t remember when I ate my first taco or Peking duck. I suppose I had the latter first as it was tradition in my family during our early years in America to eat at least one fancy Chinese restaurant meal when we travelled far into the bowels of old Chinatowns for our weekly Asian grocery procuring binge. Every once in awhile, we would order the magnificent Peking Duck feast; a meal unto itself using a whole roasted duck served in several different courses. The roasted and crispy duck skin with succulent meat wrapped in a flour pancake and served with slivers of scallions, cucumbers and hoisin sauce was always served first and consumed in a flash. Mexican food made an impact later, when I spent a few collegiate years nestled just north of the California-Mexico border studying partying late into the nights. What better option for cheap and delicious sustenance than the “open-til-3 am.” taco shop just stumbling distance from the old beach house where I shared good quality study hang time with two (and sometimes four or five) other roommates? A fiver would buy me a couple of juicy carnitas tacos and a side of fresh tortilla chips with salsa or a bag of chicharrones – that wonderful, crispy snack of deep fried, puffed and seasoned pork skin. When I moved to New Zealand, I couldn’t find decent Chinese or Mexican food. At the time, the only Chinese food most cities outside of Auckland had were hidden away in fish and chip takeaways and those could hardly be taken for anything other than fast fried food. The Mexican food rage had not begun, and during an on-camera interview with a famous New Zealand chef, I had to explain to him the fallacy of the crunchy taco shell (for those who don’t know, and I’m sorry to burst your bubble, the crispy taco shell was invented in the United States much like fortune cookies, chop suey and rainbow sushi rolls). By the way, that piece with the famous chef never aired as the producers didn’t want him to look anything less than an all-knowing food god. Hence, I learned to adapt and make my own favourite meals at home. With fresh ingredients and a well-equipped kitchen, I created a dish that celebrates these food cultures that have made such an impact on who I am today. With a little bit of time and good prep, you can also make these delicious tacos for your family. The following recipe serves two as a main dish, and four as appetizers. Mix salt and flour together, then add lard and mix with fingers until flour looks crumbly. Add water, but not all at once. Do it 2-3 tablespoons at each time and mix dough until it becomes tacky and sticks to your fingers, but not mushy and wet, and you can form a ball with it. Take dough, and work on floured bench until it has a smooth and elastic consistency. Place dough in bowl and rest under either plastic or wet towel at least 30 minutes and up to one hour. Roll the dough into a tube shape and then cut into 8 equal pieces. Roll each piece into a ball and flatten before using a rolling pin to roll out into a thin tortilla. Flour each side and set aside. Using low-medium heat and a heavy non-stick pan, toast tortillas on both sides until you see golden brown spots form. You might get some air bubbles, and that’s OK. You can pop them with a knife or by pressing down on them. When done, the tortilla should be pliable and soft while looking toasted with nice golden-brown spots throughout. Try not to overcook or your tortilla will get flaky and break apart when folded over. Keep warm sandwiched between a kitchen towel in a basket. First, make the spice powder: toast two cinnamon sticks, four star anise, cloves, fennel seeds and Sichuan peppercorns on low heat in a heavy bottom pan. Once you can smell a warm and rich aroma developing from the spices, take it off the heat and grind until fine in a coffee or spice grinder. Use a fine mesh sifter to sift away any large pieces and keep the powder for seasoning the duck. Prepare the duck breasts: score the skin diagonally across a few times making sure not to slice into the lean meat. Season breasts with one tablespoon of fresh spice powder and a generous amount of fine sea salt and white pepper on both sides, making sure to rub into the skin well. Set aside the breasts. Turn oven on to 170 degrees Celsius. For the duck chicharrones: using fat and skin, chop into large dice and toss into frying pan on medium-low heat. They should start sizzling and rendering right away. Once the crackling is golden to medium brown, take crackling out of pan and put on paper towels to drain oil. toss in bowl with a dash of spice powder, cayenne, salt and white pepper. Set aside. To get medium rare and well-rendered breasts, put both breasts skin side down on medium heat in a frying pan. Render off fat while cooking for 5-6 minutes on that side. Add two star anise and two cinnamon sticks to oil. Flip breasts over and give it another two minutes on medium heat and finish in 170 degree Celsius oven for five minutes. Take duck out of oven and rest the breast on counter for ten minutes. Toss into the rubbish the star anise and cinnamon sticks. Saute garlic and ginger in oil on medium heat until fragrant and add hoisin sauce, stirring constantly to prevent the sauce from burning. Turn off heat and stir in lime juice. Add salt to taste. Blend mixture in blender until smooth, and if there are any lumps, pass through a fine mesh sieve. Pour sauce into container and set aside. You’ll need about 5-8 good stalks of cilantro, chopped. Chiffonade the green onions into 2-3 inches in length. Slice cucumber lengthwise and de-seed. Cut cucumbers into thin batons, roughly the same length as the green onions. Slice into duck breast against the grain into thin strips or large dice. The inside should be warm, juicy and slight pink. 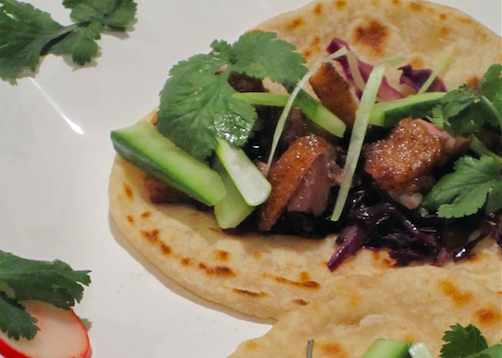 Spoon some sauce over the tortilla, take about 30-40 grams of the duck, then cucumber/green onions/cilantro to taste. Sprinkle chicharrones on top of taco and eat. Note: Frequently, I like to make a red cabbage braise to add as a filler to this taco. The red cabbage braise can be made by stir-frying the residual duck fat, thinly sliced red cabbage, equal parts rice wine vinegar and sugar, a sprinkling of salt and then braising for 15 minutes until the cabbage is completely wilted. This dish pairs nicely with a cerveza served with a wedge of lime or full-bodied Merlot.